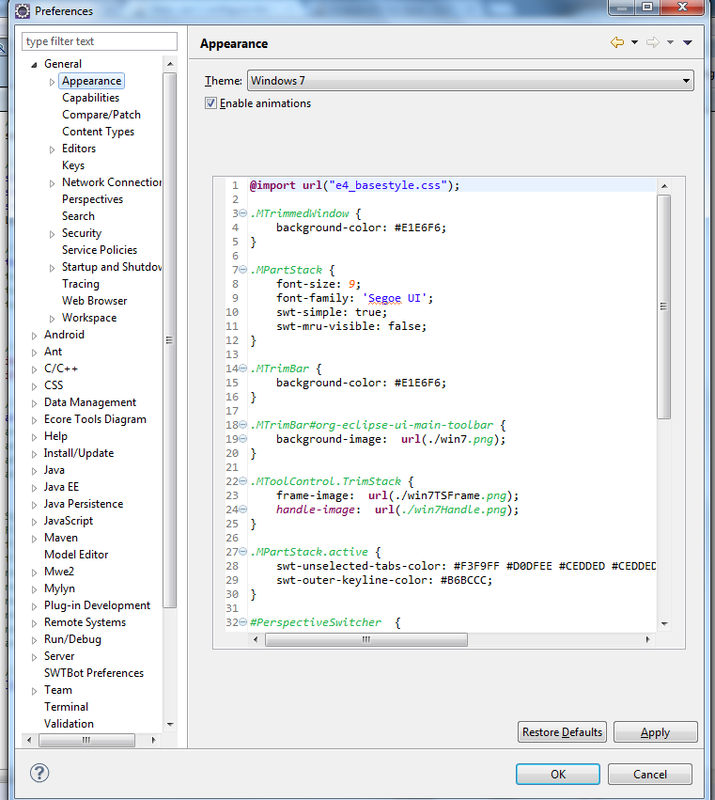 How can I configure the font size for the tree item in the package explorer in Eclipse? How can I configure the font size for the tree item in the package explorer/outline in Eclipse? Which item in Font under Preferences I should change? 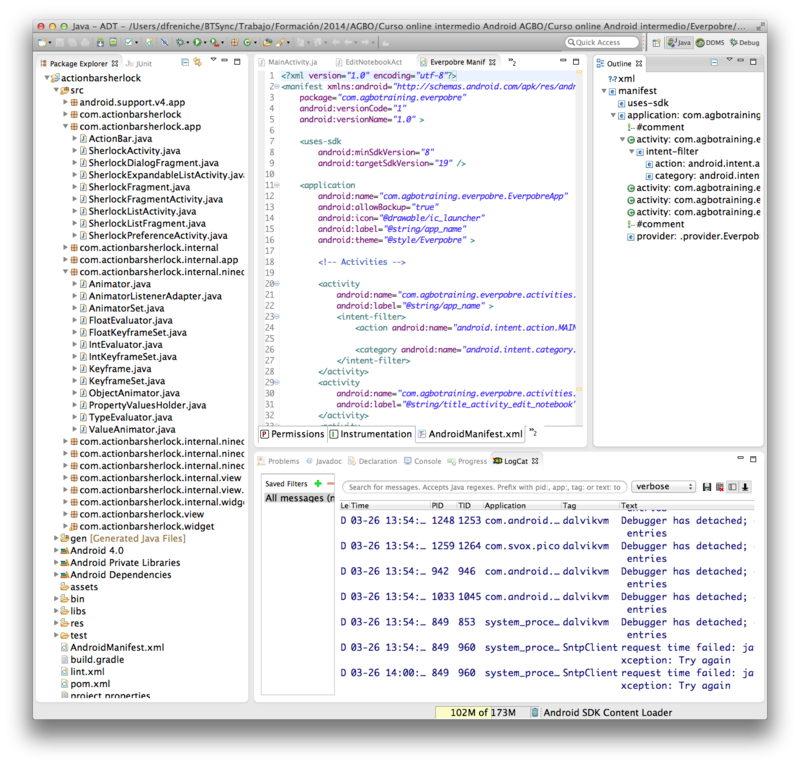 In 2010, there was no way in Eclipse to change the font used for Package Explorer and other such views. You can only change the font for editor views. This is a policy decision on the part of the Eclipse developers (see, e.g., bugs 49548, 202091). (Grumble.) The font used is the one set by the general look-and-feel for whatever desktop you are using. If you remove this line, you'll see the font size in various views fatten up. Change the font size for "Message Box". which works very fine with me (Eclipse v4.3-SR2 (Kepler) on Ubuntu). On Juno you can adjust that font by CSS. This answer applies to Mac OS X user. Tested with Mavericks (10.9.2) but should work in all versions. 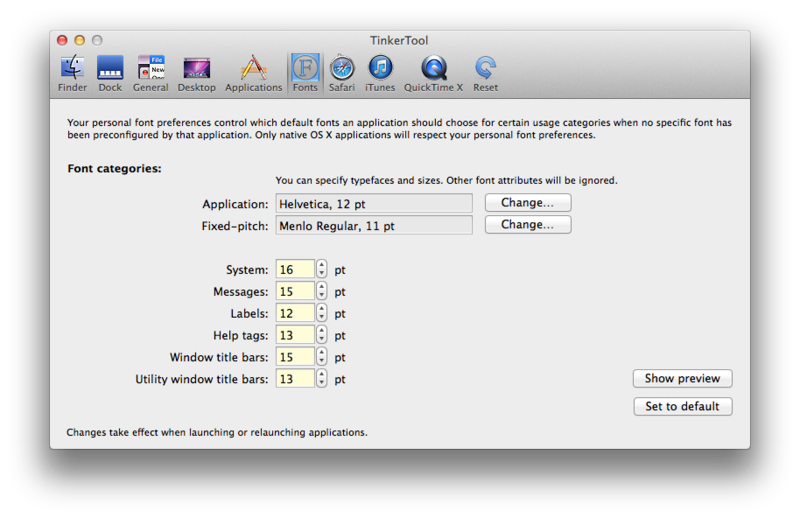 Download the free Tinker Tool utility and adjust font sizes. It was tested with Eclipse v4.4 (Luna) and Eclipse v4.5 (Mars) on Windows 7. Eclipse v4.5 (Mars) using the built-in dark theme on Linux. As someone has already mentioned previously, modifying the "e4_basestyle.css" file worked for me on Eclipse v4.3 (Kepler) and Windows 8. Preferences → Appearance → ColorsAndFonts, under the Git section. to make sure that text size/colors for uncommitted files are in sync with your changes. This is of course if you initialise your project as a repository. Eclipse inherits the font size of the GUI items, from the operating system. For a demo for example you might want to increase the font size of your OS. Switch at least "Message Boxes" to font size e.g. 13 instead of 9 (for Eclipse Package Explorer Tree). I would switch "Menus" also to font size 13 (for Eclipse main menu). The following solution works on Mac OS with Eclipse v4.4 (Luna). Choose Mac appearance: menu Window → Preferences → General → Appearances → Theme: Mac. Eclipse uses a system user interface font for Project Explorer, so you can change it with an OS-specific method. Note: Eclipse will have to be restarted even if other apps respond immediately to the font change. On Linux (Gnome), I was able to alter Eclipse's font with Gnome Tweak Tool (Applications → Utilities → Tweak Tool). If it's not already installed, try sudo yum install gnome-tweak-tool or sudo apt-get install gnome-tweak-tool. In the Fonts page, change the Interface font. On Mac, unpack the Tinker Tool, run it, go to the Fonts tab and adjust the size of Help tags (tested with Eclipse 2018-12). Some other parts of Eclipse will also be affected, such as the startup dialog. 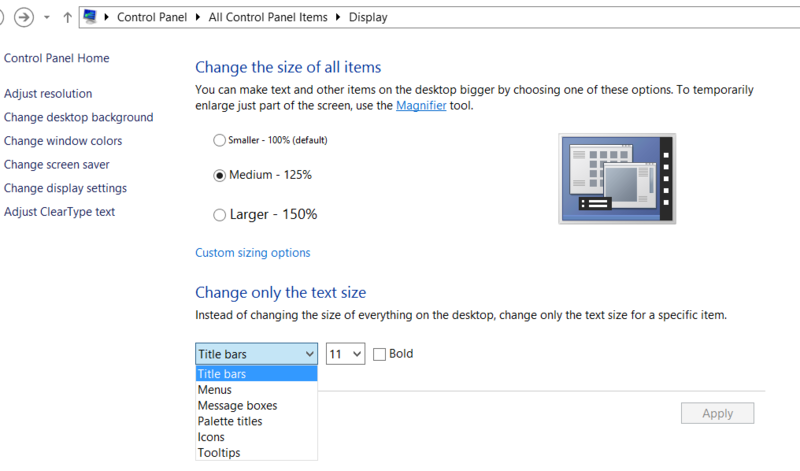 The Windows 10 Creators Update apparently removed the ability to "Change only the text size" in "Display settings". In addition the update reset my previous text size setting so that I ended up with small font size in the tree items of the package explorer. A solution that worked for me is to use a small tool 'A+ System Font Size Changer'. There, increasing the "Message box" setting to 4 (a custom unit defined by the tool) and applying the setting changed the font size in the items of the package explorer. The tool also allows you to increase the size of "Menu", "Title bar", "Palette title", "Icon" (which worked wonders on the display of folders in windows explorer), and "Tooltip". P.S. : I would have preferred to comment on the answer from Hartmut, but my reputation score is too low. Note: It is applied based on system setting ,not only for Eclipse based platform. To change fonts in eclipse workspace with ubuntu, I modified system fonts desktop > system > preferences > appearance > fonts also modified eclipse indigo -> windows > preferences > General > Appearances > Colors and fonts. It reflected in eclipse. In the middle of the screen there is a drop down under the heading Change Only the Text Size, select Message bokes. Change the font size in the adjacent drop down. In Eclipse v4.2 (Juno) you can modify the CSS by going to menu Window → Preferences → General → Appearances. This example is for the Dark theme in Eclipse v4.4 (Luna). Pick the CSS file that you are using per Preferences → General → Appearance inside the Eclipse UI. *It was performed on ScalaIDE version of Eclipse v4.4 (Luna) and should be the same for regular Eclipse v4.4 (Luna), I think. You could add the following code snippet into below css file. The value of font-size could be set as wish. Add the "font-size:13;" like the above code snippet and apply via the below steps. I have two screens, a small and a large one. Eclipse is using the size settings from the "main screen". In my case that was a small screen with a scaling of 150%. Switching the main screen to the large screen resolved the size issues for me. Eclipse RCP: How can I bold a folder in Project Explorer? Keyboard shortcut to change font size in Eclipse?